GOG will be selling Rune at a 50 percent discount for the next week. Back before Skyrim had everyone donning horned helms there was another action game that had PC players battling their way a Viking fantasy of mythological proportions. This game was Rune, an underrated gem that, through the grace of GOG, gamers can enjoy once again. Dropping players into a battle to halt the coming of Ragnarok (the end of the world for the unversed), Rune earned some stalwart fans in its day with its visceral combat, fun multiplayer and all around epic presentation. Gamers interested in picking it up today will find it on sale for $4.99. The current 50 percent discount will only last for the game's first week however, so if you're considering buying it, this is the time. This purchase will, of course, come with the usual swath of GOG goodies, including the game's soundtrack which is filled to the brim with all the mythological bombast that you'd expect from a game based around some of history's most feared warriors. 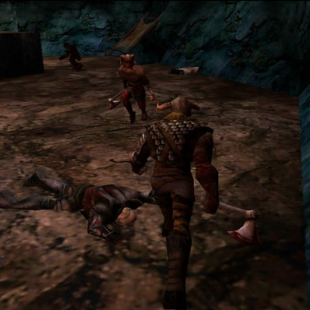 The game also comes packaged with the 2001 Halls of Valhalla expansion which added new maps, characters and two game modes to the original game's multiplayer. With Carmgaeddon 2 released earlier this month and Rune now hitting GOG's shelves, October has been a good month for retro releases. Here's hoping November turns out to be just as decent. In the mean time, keep your eyes peeled next Thursday as we'll be taking a closer look at Rune in a new Good Old Review.